At no additional cost we will have one of our crating experts design your custom crate to your specifications to help meet your companies needs. At All Crate, Inc., we take care to provide our customers high quality services personalized for their unique needs. We frequently load and brace 20' and 40' ocean containers so that our customers' products arrive at their destination safely. We can provide a safe secure place for your products or materials to be stored during processing. 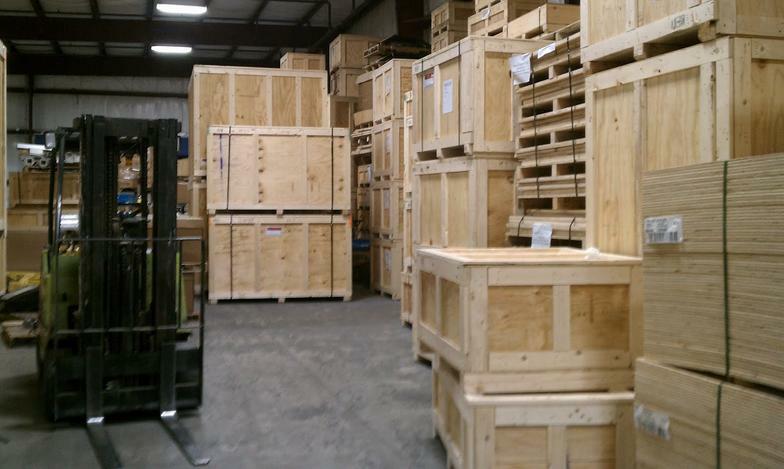 We can crate on demand as your need arises or store after crating until you are ready to ship. We can coordinate your total end-to-end transportation and packaging needs. All Crate has many strategic partners we work with to provide door to door service at competitive prices. We have a overhead 5 ton crane to remove and load products onto trucks (inside dock) or into crates. Let us also coordinate your business moves. If needed we will coordinate with local freight forwarders to make sure your products leave our dock in a timely fashion to meet our customers' deadlines. On larger jobs, an All Crate representative will go on-site and measure the equipment before quoting to ensure accuracy. By request, we may also provide on-site crating for larger jobs that are logistically impossible to transport.